New Pebble hardware and software are reportedly on the agenda for next week as the company teases a big announcement on its website. Citing multiple unnamed sources, 9to5Mac reports that Pebble is getting ready to announce a new smartwatch with a color, “e-paper-like” non-touch display. Incidentally, Pebble put a countdown clock on its site this week, due to expire at 10 a.m. Eastern time on Tuesday. The new watch may be wider than the existing Pebble and Pebble Steel, 9to5Mac reports, but will be thinner, while maintaining similar battery life of up to a week on a charge. The charging pins have reportedly moved from the side to the bottom of the device—hopefully indicating a sturdier docking mechanism—and the chassis could be plastic with aluminum sides. Other features may include a microphone for voice commands (powered by Nuance) and an improved backlight. While the watch reportedly won’t have a heart rate sensor, Pebble could eventually offer wristbands with additional sensors. 9to5Mac says that pricing could be similar to the Pebble Steel, though its unclear whether this refers to the original $250 price or the $200 price tag it carries now. Pebble itself has hinted at big changes to come, with CEO Eric Migicovsky telling The Verge that it has invented “a new framework to use as an interaction model on the watch.” The report from 9to5Mac doesn’t have many details on this front, but says the redesigned software will be “dramatically different.” It’s unclear what this means for current Pebble watches, whose software has seen many improvements over the last year. 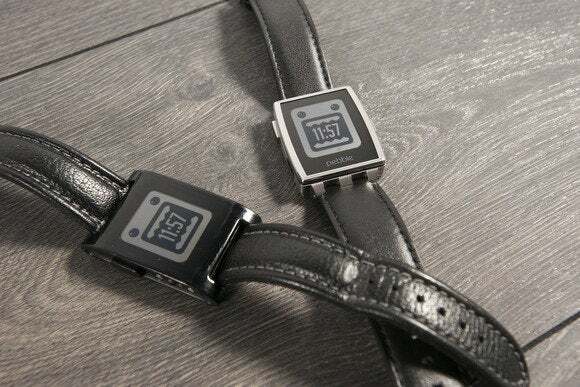 Why this matters: It’s been over two years since Pebble started shipping its first smartwatch to Kickstarter backers, and the hardware is looking increasingly dated next to color devices such as the upcoming Apple Watch and Android Wear watches. A color display and voice controls would be major improvements, but the secret sauce for any smartwatch has to be in the software. It sounds like we’ll find out how it all comes together soon enough.